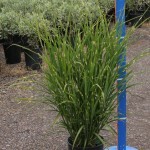 A stiffly upright grass with wide green leaves that have horizontal yellow stripes. The copper flowers appear in September. 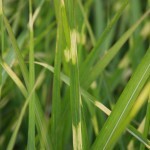 It forms clumps which can be divided in spring before new growth appears. 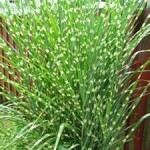 It is easily grown in full sun to part shade in an average, well-drained soil. Cut the old foliage to the ground in late winter, just before the new growth emerges.